A reader, David Nash, wrote to me asking about the following quote, which he’d spotted on Twitter. To give an example, one person may tell a small lie, and then to cover that up they create more and more lies, along with patterns of defensive anger, etc. A whole life of deceit may be built up. Another may tell a small lie, but then immediately regrets it and corrects their account of events. The current of deceit is born and dies in an instant. Let yourself be open and life will be easier. 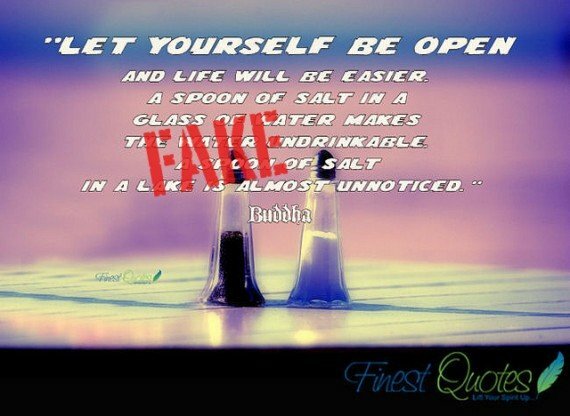 A spoon of salt in a glass of water makes the water undrinkable. A spoon of salt in a lake is almost unnoticed. Buddha’s Little Instruction Book is a lovely book, and I’d recommend it. Jack certainly had no intention to mislead or to create a fake quote; the problem is simply that many readers seem to have missed the description on the back cover that says that jack has “distilled and adapted an ancient teaching for the needs of contemporary life.” It’s fine to distill and adapt the Buddha’s teaching, of course. But unfortunately many people have taken the book as a book of Buddha quotes.